Cool Kong is a totally cool floating retriever toy. Use in field or water, the durable throwing rope makes long distance throws easy. Rope measures over 1 1/2 foot long. 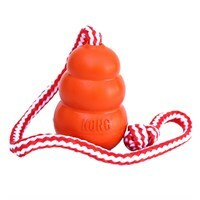 Your dog will love this Cool Kong all year-round.